Welcome! The lobby of the Deranged L.A. Crimes theater is open. Grab a bucket of popcorn, some Milk Duds and a Coke and find a seat. 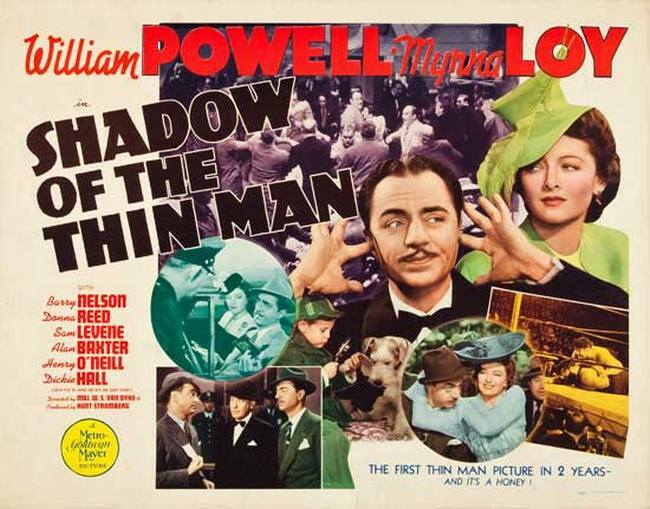 Today’s feature is SHADOW OF THE THIN MAN starring Myrna Loy, William Powell, Donna Reed, Barry Nelson and Asta (his real name was Skippy). If you miss this showing for any reason you’ll be pleased to know that TCM is showing it on December 31st. In San Francisco, former private detective Nick Charles enjoys a peaceful retirement with his attractive wife Nora, their young son Nick, Jr., and their wire-haired terrier, Asta. One afternoon, when Nick and Nora go to the races, they learn from Nick’s old friend, Lieutenant Abrams, that a jockey named Gomez has just been fatally shot. In the jockey room, Nick’s police and reporter friends think that he is on the case, but he insists that his detective days are over, even when one of the jockeys piques his curiosity by saying that Gomez was killed because he refused to throw a race. Film Noir Friday-Saturday Matineee: I Wake Up Screaming! Welcome! The lobby of the Deranged L.A. Crimes theater is open. Grab a bucket of popcorn, some Milk Duds and a Coke and find a seat. 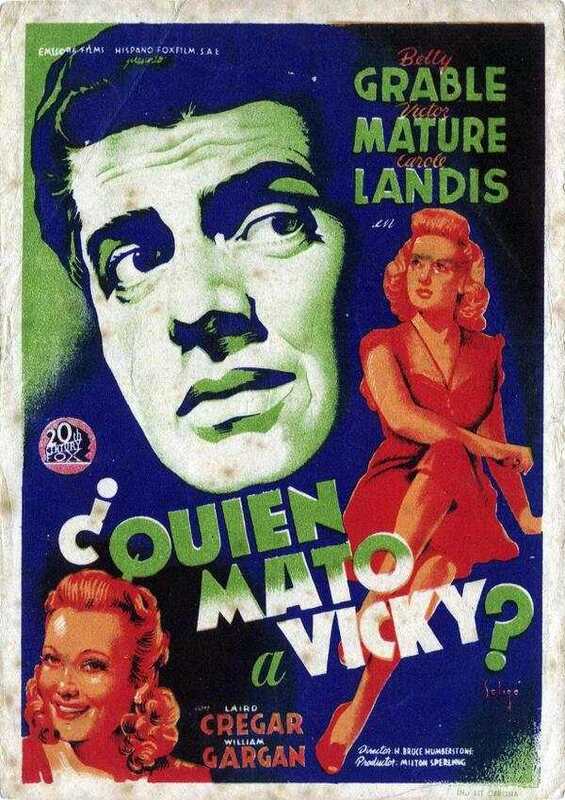 Today’s feature is I WAKE UP SCREAMING starring Betty Grable, Victor Mature, Carole Landis, Laird Cregar and William Gargan. After beautiful Vicky Lynn is killed, New York City police question Frankie Christopher, a promoter who sponsored Vicky, “glamorized” her and got her jobs as a model. 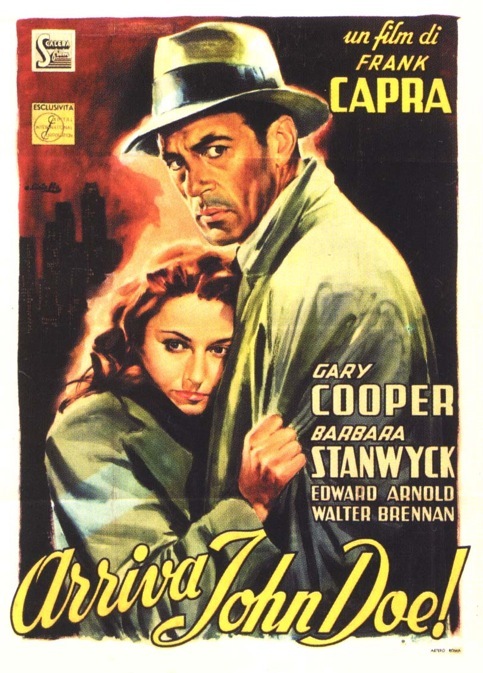 Especially tough on Frankie is obsessed inspector Ed Cornell, who has never failed to get his man. Jerry MacDonald, a more sympathetic policeman, asks Frankie to tell them how he met Vicky, and Frankie tells his story. Welcome! The lobby of the Deranged L.A. Crimes theater is open! Grab a bucket of popcorn, some Milk Duds and a Coke and find a seat. 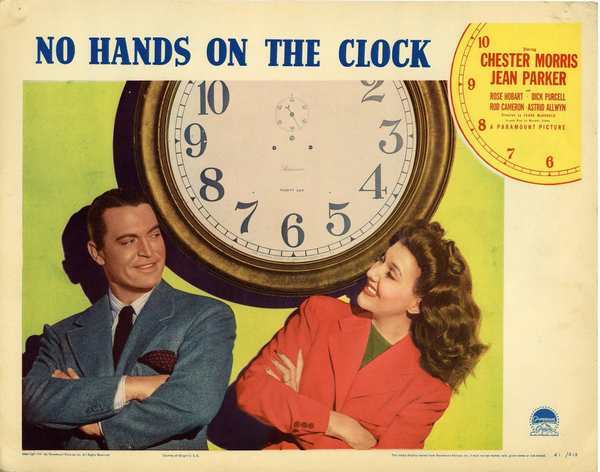 Tonight’s feature is NO HANDS ON THE CLOCK starring Chester Morris and Jean Parker. Enjoy the movie! Private detective Humphrey Campbell informs his harried boss that not only has he tracked down the missing girl from his last case, but also married her. Before they can start their honeymoon, Campbell is dragged into another missing person case, which develops into a kidnapping related to a plague of bank robberies. By investigating a skein of blondes, redheads and brunettes, he invokes the suspicions of the Feds, as well as his jealous new bride. 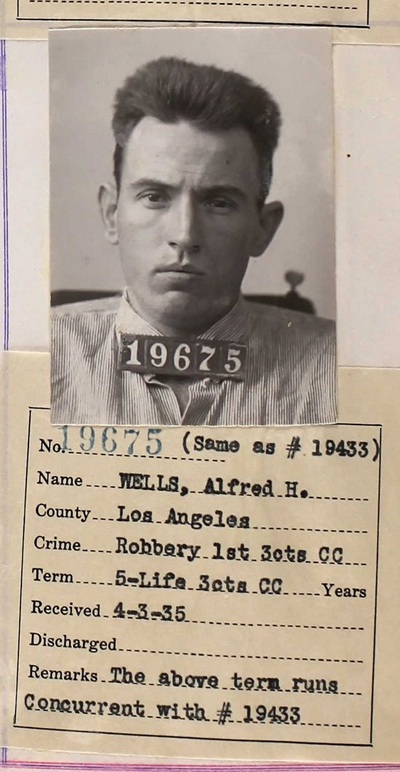 By May 1941 Alfred Wells had been in trouble with the law for most of his 31 years. In 1927 he was sentenced to from 18 months to three years in Pittsburgh, PA for robbery, and in September, 1934, he was arrested while robbing a gas station in Fullerton, CA. He served five years of a five to life sentence in San Quentin before he was paroled on November 24, 1939. Over the next couple of years he was busted for vagrancy and various other petty crimes, but nothing big enough to send him back to prison. Alfred was neither the brightest guy, nor was he the most articulate, so his go-to behaviors for problem solving were threats and violence. He had learned his people skills at home as a kid. His stepfather used to restrain him while his half-brother, Ray, savagely beat him. He was the perfect size for a punching bag (4′ 10 3/8″ according to his prison records), and he was slightly hunchbacked. He was described as having “very dark brown or black hair, a knot on back just above waist, very pronounced hunchback, limps when walks, leans forward and to left when walks, knife wounds left side of abdomen, left hip and back.” With no report of a traumatic injury to his spine, Alfred’s hump may have been the result of congenital kyphosis. If there was any medical help available for the condition at the time neither Alfred nor his family could have afforded it. Not long after his parole Alfred moved to San Bernardino. Most of his family lived there and no matter what they had done to him at least they were blood. He asked his stepmother, Violet Wells Davis, if his 19 year old half-sister, Violet, could work as his live-in housekeeper. She agreed and when Violet went to live with Alfred nobody thought anything of it. None of the family knew that Alfred had become obsessed with Violet and that he immediately coerced her into a sexual relationship. Alfred threatened to kill family members and/or himself if Violet ever left him. The incestuous relationship was kept a secret for nearly a year before relatives finally became aware of what was happening and, without saying a word to Alfred, spirited away the object of his obsessive lust to her parent’s home in Escondido. When he learned that Violet had disappeared, and nobody would admit to knowing where she had gone, Alfred went berserk. On May 7, 1941Jean Wells, Ray’s wife, their 13 month old daughter, Hester Violet, and a house guest, 17 year old Rose Destree, drove Alfred out to the Devore brush lands, ostensibly for a job at a chicken ranch. When they arrived at a secluded spot Alfred forced the two women from the car and then confronted them with a gun. He demanded to know the whereabouts of Violet, but neither woman would talk. Alfred then demanded that Jean write a note to Ray–it read: “Honey, Al is holding Rosie and the baby and me. He wants Violet returned to him. I think it is better that you do what he says and go with him, and then you can come to us.” Jean must have sensed she had little time left so she added a postscript: “Don’t forget our slogan, Dear–I love you always.” Alfred pocketed the note and held the baby in the crook of his left arm. Then he jammed his .32 caliber revolver against Jean’s chest and pulled the trigger. She died where she fell. He turned the weapon on Rose and fired. She collapsed on the hard, sandy ground, just as Jean had done. Altogether Alfred fired four shots, two into each of his victims. He placed Hester on Jean’s chest. Even if she lived through the night, Hester faced a horrible death the next day–the temperatures were expected to reach triple digits. Satisfied with his handiwork Alfred turned away from his victims, got into the car, and drove away. He was determined to locate Violet. NEXT TIME: Alfred’s search for Violet, and his deadly rampage, continues. Welcome! The lobby of the Deranged L.A. Crimes theater is open. While I am working on the final installment of COPS BEHAVING BADLY: THE DEATH OF STANLEY BEEBE, why don’t you take a film break. Grab a bucket of popcorn, some Milk Duds and a Coke and find a seat. 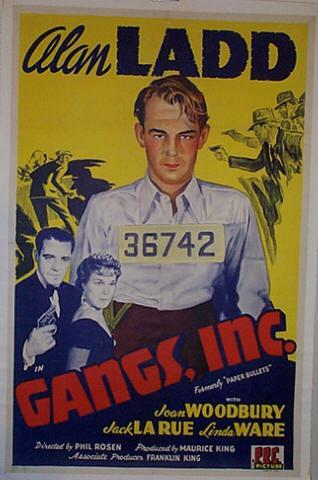 Tonight’s feature is GANGS, INC. (aka PAPER BULLETS) starring Alan Ladd, Joan Woodbury, Jack LaRue and Linda Ware. At a playground, little Rita Adams is enjoying a reunion with her ex-convict father when he is suddenly shot to death. Rita is sent to an orphanage, where her closest playmates are Bob Elliot and Mickey Roma. Her father’s prison record continues to haunt Rita as an adult, and she loses her factory job when she cannot get bonded. Rita’s roommate, aspiring singer Donna Andrews, secretly calls Bob, now an aerospace engineer, hoping he can help his old friend find work. Bob has always loved Rita, but she is involved with Harold DeWitt, the dissolute son of the powerful Clarence DeWitt, who disapproves of their relationship. While they are driving one night, the intoxicated Harold hits and kills a pedestrian. 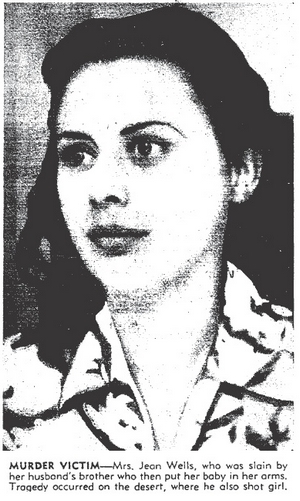 Acting on the advice of his father’s attorney, Bruce King, Harold persuades Rita to take the blame for the accident, promising to marry her and assuring her that she will not have to serve time. Is it just me or does Harold’s promise to marry Rita strike a false note? Sounds to me like another big lie along the lines of: “The check is in the mail”, or “I’ll always love you.” I’m sure I’ll be shouting at the TV telling Rita not to believe him, but I don’t imagine she’ll take my advice. Welcome! The lobby of the Deranged L.A. Crimes theater is open. Grab a bucket of popcorn, some Milk Duds and a Coke and find a seat. 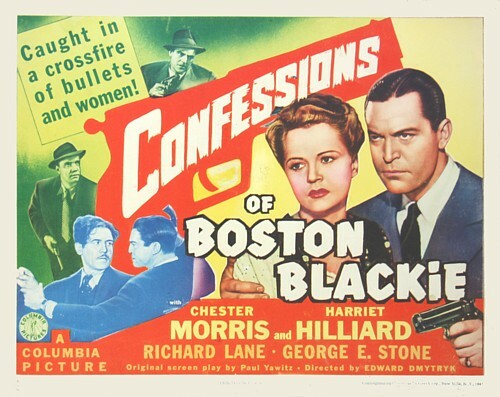 I confess, I’m a sucker for crime dramas with a little comic relief in the mix, and I’m particularly fond of Boston Blackie, so tonight’s feature is CONFESSIONS OF BOSTON BLACKIE starring Chester Morris and Harriet Hilliard (Mrs. Ozzie Nelson). Delightful second entry in the series finds Blackie, trying to smash a murderous art forgery racket, being chased by the killers as well as the relentless Inspector Farraday. George E. Stone joins the cast as Blackie’s sidekick ”Runt” (replacing Charles Wagenheim), providing ample comic relief. Welcome! The lobby of the Deranged L.A. Crimes theater is open. Grab a bucket of popcorn, some Milk Duds and a Coke and find a seat. 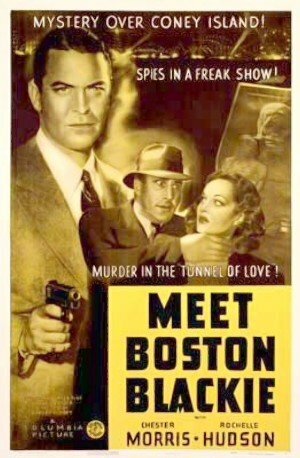 I confess, I’m a sucker for crime dramas, so tonight’s feature is MEET BOSTON BLACKIE starring Chester Morris and Rochelle Hudson. D: Robert Florey. Chester Morris, Rochelle Hudson, Richard Lane, Charles Wagenheim, Constance Worth. First in the Boston Blackie series is a slick and fast-paced mystery-comedy, introducing Morris as the whimsical ex-thief tracking down spies hiding out at Coney Island. Franz Planer’s stylish cinematography enhances this solid programmer.